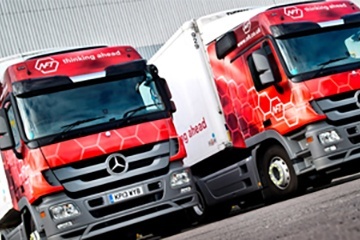 Working for big names like Sainsbury's and ASDA, it is no wonder they can claim that there is a one in three chance that the fresh chilled food item you have just purchased from the supermarket will have travelled on an NFT truck at some point in its life. "To be the leading provider of time-critical logistics services"
OBS Logistics provides NFT Distribution with the CALIDUS NFT using a transport management system across their primary chilled transportation network, involving over 300 tractor units and refrigerated trailers. Because of the mission-critical nature of the operation, OBS also provides a Facilities Management service for the servers at their two data centres - plus Disaster Recovery support to NFT's 7x24 hours network. "There are substantial benefits," says David Frankish, CEO, NFT Distribution. "The same system allows us to manage large contract distribution for major supermarkets, alongside shared user distribution. This level of flexibility brings us yet lower costs through economies of scale." Customer Service is part of NFT's mantra and CALIDUS Total Logistics contributes to improved service with Proof of Delivery presentation to the web, proactive event management and strict KPI monitoring. NFT use in-cab technology called Transmart for point-to-point real-time traffic information, fully integrated with the CALIDUS Transport Management System. In-cab terminals provide an 'electronic' Manifest and shift information. Drivers confirm arrival and departure from locations, on-bay and off-bay times, units of product collected or delivered, and they can send text messages to the traffic office to advise of any issues on the road. These capabilities allow quick response to discrepancies from plan by traffic office management, as they happen. GPS tracking provides real time map view of the fleet and 'geofence rings' can be configured for each depot and location. As vehicles break geofences, alerts of arrival are automatically issued. Altogether a more accurate measure of arrival and departure times for SLA management. As further testament to the NFT-OBS relationship, NFT is now implementing Warehouse Management Systems from OBS Logistics.